The November release festivities will begin in just a few short days! 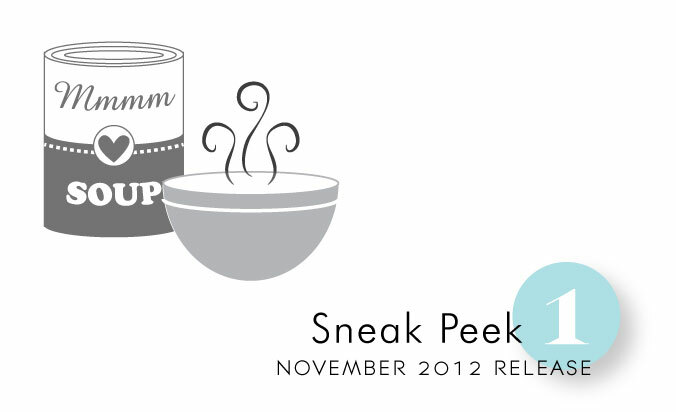 And we have some very exciting products to share with you this month! So exciting in fact, a few sneak peeks of what's to come are definitely in order! Lexi Daly has a new set coming out this month, the perfect set for sending someone a little note when they are under the weather or going through a rough patch. The adorable images in the set really open up so many creative possibilities! Oh, and I can't forget to mention the coordinating dies! Heather Nichols has taken inspiration from the popular signs that are so trendy in home decor right now and created a fabulous new sentiment set. Large enough so they can be used either inside and outside a card, the variety of sentiments cover everything from getting better to birthdays, thank you to congrats. Truly a unique addition to your collection. Love the sneak peaks, I’m feeling better already! Wow, theese are BEAUTIFUL!!! Great ideas!!! Awesome! Love the soup can and bowl. And Heather’s set is amazing!! Oh, Awesome! Love Heather’s set. And the soup can and bowl are so sweet. A super useful set of images, all these sniffing people in fall can use a sweet card. Both look like handy sets to have in the stamp collection! The soup can is too…..cute! Steaming soup and a warm blanket of love, says it all! Can’t wait to peek at more. The soup can and bowl are adorable. Love Heather’s set too, gotta have words and ones that can be the focal point are twice as good. I look forward to the sneak peeks and this month looks like a winner already. Glad you created some stamps for ‘rough patches’…seems like so many folks have hit them! Looking forward to seeing this release! Very cute! Can’t wait to see what else is coming up!! And would love some soup right now. Looks very cute! Off to a great start and don’t you love it when the 5th falls on a Monday for a double treat? I.love.soup. I’m excited about both sets. Great sets….they’re soothing just to look at. Great little sets, love the soup can and bowl AND the fact that there are dies (my fav’s). 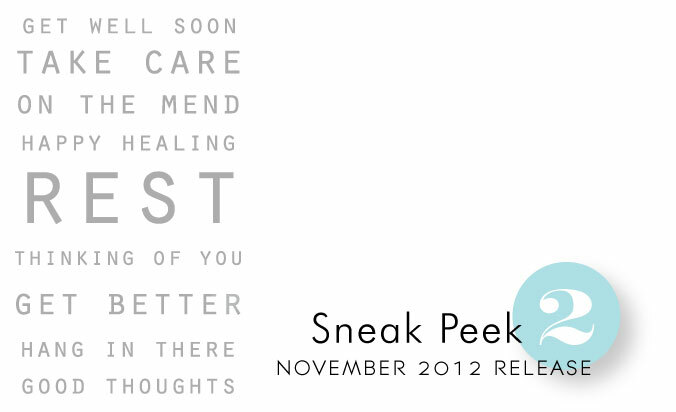 Love Heather’s trendy take on “healing” wishes too, very chic! I see lots of gift tags being made with these new sets. Just in time for the holidays, too. Love the soup can, perfect release for flu season! These look interesting. Can’t wait to see design team take on these. I love the “subway art” look so much and this set will make a great background for a get well card! Oh my, how cute is that soup can!!!! OMGosh! I love love the soup can and bowl!! caauttte! I always need stamps and sentiments for get well cards! This is looking real good. The sentiments look really intriguing. This first sneak is a perfect combo of graphics and font!! Love the soup can and the sentiment choices!! Wow! Can’t wait to see the rest of this set! Soup is the perfect winter warmer! Can’t wait to see the sentiment too! These sneak peeks are killing me! Love both of these and can’t wait to see what they look like. These look like great ideas. I can never have enough sentiments! Love the hot bowl of soup, looks like fun winter/feel better sets are coming! Interesting new stamps! I could think of a couple good cards to make with them. Always waiting the sneak peeks with anticipation and the are always so perfect!!! I love this sentiment trend! The soup can is just adorable. Looking forward to seeing the rest of the set! how cute is that can???? and I love the sign! fab job, ladies! Love the soup can, adorable. Great idea, too! Aww love the soup can. Cute!